Lost Cathe’s Chapters on Your iPhone? 1. Open iTunes and select the Cathe videos for which you would like to re-enable chapters. 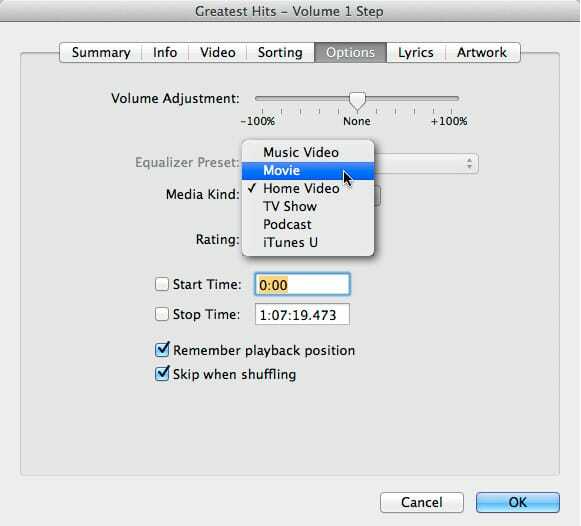 You can select them individually or hold down the command (Mac) or control (Windows) key to select multiple videos at a time. 2. Right click on one of the selected videos and choose “Get Info.” Don’t worry if the message “Are you sure you want to edit information for multiple items?” appears; just click on “Yes” and proceed. 3. Click on the “Options” tab in the window that pops up (the window will look a little different depending on if you selected just one or multiple videos). 5. Re-copy your Cathe workout videos onto your iOS device by first removing them from your Videos app on the device, then dragging them back onto it from within iTunes. Apple also changed the way that you access the chapters in iOS 7. Instead of having the handy little widget in the lower right corner of a playing video that you used to tap on to pop up the chapter list, you now have to access the list from the “info” page for the video. While on the information screen for a video (the one that opens when you tap on a video in your list of movies), under the title and artwork of the video are two buttons. By default, “Details” is highlighted, but if you tap on “Chapters” you’ll see the complete list. Just tap on where you want to go and your video will start playing from that chapter point. To access the chapters while you are playing video, you have to tap on “Done” in the upper left corner of the window to access this list (a step backward from the old method, but at least it works! ).